Authorities in Dubai and Abu Dhabi are unhappy that they are unable to monitor such encrypted communications via the handsets. 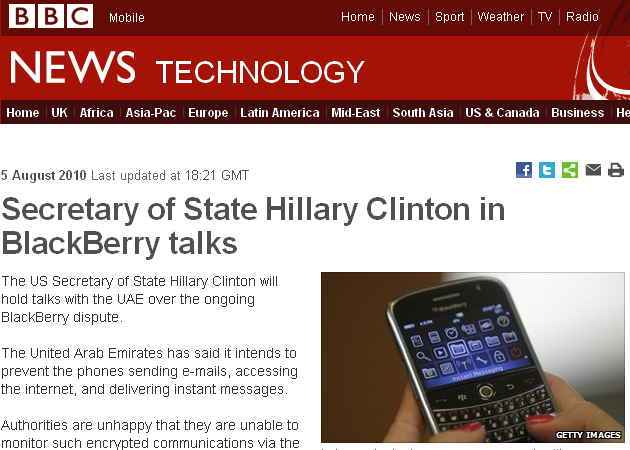 Mrs Clinton said authorities had to balance “legitimate security concerns” with “right of free use and access”. legitimate security concern,” Mrs Clinton said. “But there is also a legitimate right of free use and access. “So I think we will be pursuing both technical and expert discussions as we go forward,” she added. The Dubai Cassation Court has issued a principle stating that failure to pay one commercial debt is sufficient to declare a company bankrupt. The court has based the principle on the Commercial Transactions Law, which states that to declare a company bankrupt, failing to pay a number of commercial loans is not the provision, but failing to pay only one debt is sufficient as it implies a shaky financial status. The law also allows the creditor of a limited liability company to ask the court to declare a company bankrupt if it fails to pay a mature debt. The court issued this principle after hearing a dispute between two companies one of which asked the court to declare the second bankrupt, red seal it and appoint a judicial guard to manage it and preserve its money. The company said in its complaint that it had obtained a judicial ruling regarding its entitlement for the credited amount of Dh921,000 in addition to the legal profits. The court found that other creditors are asking for their money and for the seizure of the respondent company’s money. The respondent company has no location and activity, which clearly proves that it will not pay debts upon maturity. The situation shows the shaky financial status of the respondent company, which subjects its creditors to a real risk that deems declaring it bankrupt. The Court of First Instance had turned down the case. The Court of Appeal had also upheld the verdict of the Court of First Instance. 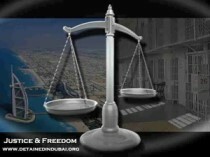 The Court of Cassation rejected the verdict and accepted to hear the case again. The Court of Cassation said in its statement that the respondent company is still, and without any right, not paying commercial debts despite of their maturity. There are also seizure claims by other creditors filed against the company. Besides, criminal cases were filed against its director for issuing bad cheques that landed him in jail. The court cannot consider having the partner in jail as a reason beyond his control, but rather it was the result of a deed he has committed: signing bad cheques, the court debated. All these are sufficient evidences about the shaky financial status of the company that subject its creditors to real risk, concluded the principle by the Court of Cassation.